Precious metals ended mixed Monday, with gold snapping a three-session winning streak and silver gaining for a fifth session in a row to mark a 2-month high. Gold for December delivery declined $3.60, or 0.3%, to settle at $1,290.40 an ounce on the Comex division of the New York Mercantile Exchange. "There was no further news of verbal saber-rattling between North Korea and the U.S. over the weekend, with the result that this geopolitical risk appears to be being priced out again somewhat," MarketWatch quoted Commerzbank analysts led by Carsten Fritsch in a note Monday. Gold futures traded from a low of $1,284.20 to a high of $1,296.40. They jumped 2.3% last week, ending Friday at their best level since June 6. Silver for September delivery added 5.2 cents, or 0.3%, to $17.122 an ounce. The settlement was the highest since June 14 when prices ended at $17.136 an ounce. Silver futures ranged from $16.92 to $17.22. They soared 5% last week. October platinum dropped $14.80, or 1.5%, to $974.90 an ounce, trading between $969 and $990.10. Palladium for September delivery added $3.45, or 0.4%, to $898.15 an ounce, ranging from $892.75 to $900.95. Last week, platinum rose 2.1% and palladium advanced 2.3%. Gold declined $3.80, or 0.3%, to 1,282.30 an ounce. Silver fell 12 cents, or 0.7%, to $16.97 an ounce. 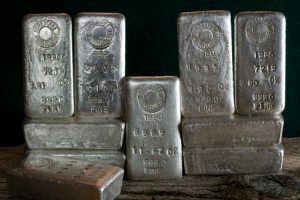 Last week, London bullion prices logged gains of 2.3% for both gold and silver, 1.9% for platinum and 1.6% for palladium. United States Mint bullion sales were unchanged as of 3:13 p.m. ET. Below is a sales breakdown of U.S. bullion products with columns listing the number of coins sold during varying periods. Products with an asterisk (*) are no longer available.